WALLINGFORD, Conn., July 10, 2011 /PRNewswire/ — Edible Arrangements®, the pioneer and leader in artistically designed fresh-fruit displays and chocolate dipped fruit, is celebrating its third National Dipped Fruit Week beginning today. Customers are invited to visit their nearest Edible Arrangements® store and take home a 12-piece box of chocolate dipped fruit for only $10, normally a $25 value. Fruit selection varies and includes any of the following: bananas, oranges, apples and pineapple. $10 dipped fruit boxes must be picked up at a local store and are not eligible for delivery or shipping. Customers can order online at www.ediblearrangements.com/dippedfruitweek, through the call center at 1-877-DO-FRUIT, or by visiting a local Edible Arrangements® location. Edible Arrangements® fruit experts are located in over 1,000 stores in communities nationwide. Additionally, this summer Edible Arrangements® has launched Random Acts of Happiness®, a non-profit program benefiting Big Brothers Big Sisters. For more information, please visit www.actsofhappiness.com. CEO Tariq Farid launched Edible Arrangements® with his brother, COO Kamran Farid, in 1999 in East Haven, CT, after years in the floral industry. 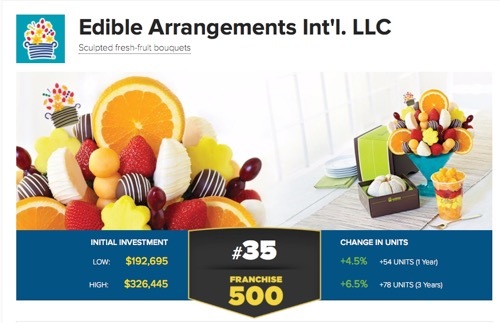 Edible Arrangements International, Inc. is the leading purveyor of fresh fruit arrangements perfect for everyday occasions and special events. Stores are located in the United States, Canada, Puerto Rico, the Middle East, Italy, India and Hong Kong. All franchise offerings are made only by Franchise Disclosure Document.